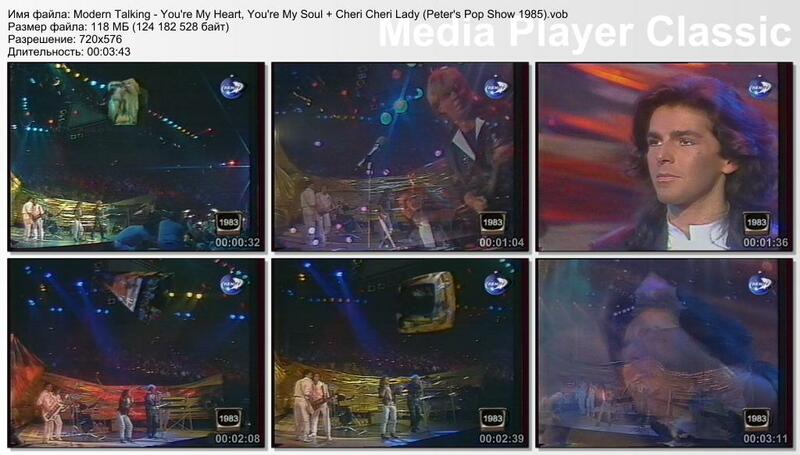 Modern Talking - You're My Heart, You're My Soul+Cheri Cheri Lady + Heaven Will Know (ZDF Peter's Pop Show 1985) 08.11. An excerpt from the show, in VOB format. I've noticed it was missing from this area and I thought of posting it. The sound is improved. Enjoy ! Последний раз редактировалось MT-Best; 13.06.2011 в 03:55. DJS! Thanks for Original Sound & Good Quality!!! When I said "sound improved", it didn't mean any tampering with the original ( I hate that technical overlapping), just a minor boost (enhancement) in the quality of the sound. If I have the time, I'll upload it again and then check it out and hear for yourself. Да это конечно все здорово,но эта версия уже стара.Есть идеальная без полосы внизу и целиком с Heawen will know.Этот вариант был актуален лет 10 назад.И то,из-за звука.